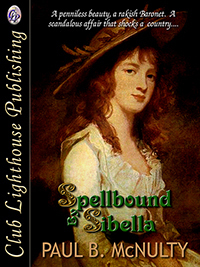 Eighteenth century Irish heiress, ANNE O’DONEL has attracted two suitors, the elderly lawyer, TIMOTHY BRECKNOCK and the dashing JASPER MARTIN. Although she is in love with Jasper, her father JUDGE O’DONEL will not agree to the match. When he decides that Anne must marry Brecknock, she rebels and becomes secretly engaged to Jasper. In an attempt to discredit him in Anne’s eyes, Brecknock accuses Jasper of philandering, and when this does not succeed, he orchestrates an attempt on Jasper’s life. Frustrated by his failure to woo Anne, Brecknock lures her out of her house late at night using a letter forged with Jasper’s signature. 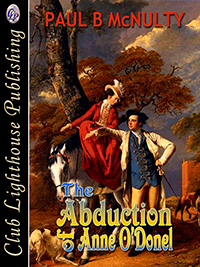 Expecting to meet her lover, Anne is abducted by four masked horsemen and taken to a remote island on Lough Conn. She is held prisoner by the Mitchell family who are under threat of eviction should she escape. Brecknock visits Anne on the island, still believing he can persuade her to marry him. He appeals to her intellect, introducing her to the world of letters through stories of romance, politics, Evangelicalism and alchemy. Believing that Jasper will find her, Anne plays a dangerous game: trying to convince Brecknock that his suit may have some hope, while delaying her agreement to marry him. Despite Jasper's ceaseless searching, time is running out for her. Brecknock’s increasingly irrational behaviour drives her to plan an escape from the island. When this fails, she persuades Mitchell’s daughter, SALLY, to take a message to Jasper. Incensed by her attempts to frustrate him, Brecknock is determined to have Anne, willingly or not. Having finally rejected his proposal of marriage, she prepares to fight for her virtue, and perhaps her life. THE HEIRESS, ANNE O’DONEL, had two men on her mind as she sat at the breakfast table: Timothy Brecknock, the erudite lawyer and the dashing Jasper Martin. Both men had sought to pay court to her. Aware of her father’s temper, she approached the subject in a roundabout manner. Anne recalled the time she had seen Brecknock in the courtroom at Castlebar. His distinguished deportment and articulate pleading had impressed her. “Mr Martin would not do that!” Anne replied causing O’Donel’s complexion to darken. Anne remembered the first time she had met Jasper. His was the first name on her card at the Maidenhill Ball. Wearing a low-cut red gown, her heart began to race when he took her hand and led her on to the dance floor. What an elegant dancer he was. She loved his soft blue eyes, dark curly hair and high cheekbones. Anne blinked her warm dark-blue eyes. “I love him, Papa.” She felt the heat of the porridge warming her body, as surely the thought of Jasper warmed her mind, on this frosty morning. Anne suspected that her father wanted her to stop daydreaming and marry the man he had chosen for her. After all, she was twenty-three; most of her friends of that age were already married or at least betrothed. “My goodness, our national hero!” Anne raised her eyebrows. “But who would want to abduct me, Papa?” Anne was horrified at the thought … unless it was Jasper, who was tempted to carry her away. That remark left Anne with much to think about as O’Donel departed. Her father favoured Brecknock as a husband, whereas she was in love with Jasper. O’Donel had the power to block her preference. Why was her father so obsessed with Brecknock? Was it possible that the lawyer had some power over him? Jasper had told her that Fitzgerald had used his powerful contacts to deliver a judgeship to O’Donel over a more qualified candidate. She resolved to discuss the dilemma with her mother and found her reading in the library. “Of course not, m-my dear; I merely sustained a minor accident,” Mary stammered. “Accident, how are you!” Anne grasped the chair in front of her. “He promised he would never strike you again.” She remembered the time her mother had left home after persistent abuse. During those summer months, Anne, just eighteen, had missed her so much until she returned in the autumn. Anne saw the rush of blood to her mother’s cheeks and tears in her eyes. “He had no right to strike you. I am disgusted with him.” She clenched her fists. “Did he ever strike you while I was away?” Mary asked. Anne embraced her mother amidst the tears. “I have plenty of time to worry about that.” She knew her mother wished to conceal the latest incident. Her family had threatened violence if O’Donel ever abused her again. “Because of curiosity about the suitors, the reader wants to keep reading.” Expert Reviewer, 2011 ABNA contest. “You write with fluidity and have a clear style.” Cornerstones Literary Consultancy, UK. “…a finalist in the 2013 William Faulkner Novel Competition,” New Orleans. “McNulty… not only educates the reader but also depicts turning points in Irish history which have never been tackled in literature...” Dublin Gazette, 2014.